To say that the Canyon de Chelly is a beautiful place would be a gross understatement. It’s more than beautiful. It’s stunning, yes, but it also has a much more elusive quality. It’s a sacred place for the Navajo People. Even for non-native atheists like me, it’s anything but ordinary. It radiates joy from its red walls. It speaks to the human soul. It echoes positive energy. It seems to exist in a parallel universe, where people and animals live in harmony with each other, and with the rest of the world. 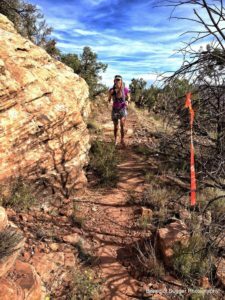 Anyone who runs the Canyon de Chelly Ultra gets to spend 34 miles absorbed in this utopian vision, courtesy of RD Shaun Martin, his family, and the Navajo People who graciously agree to share their special canyon with 150 trail runners for a day every October. Don’t get the wrong impression. 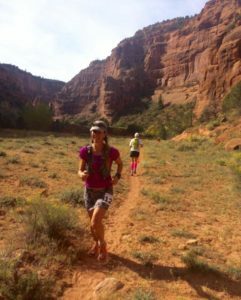 The Canyon de Chelly Ultra is more than a meditation retreat. It’s a brutal race. The elevation profile doesn’t look like much to worry about: an out and back course that appears almost flat, except for a short, steep climb near the turnaround a smile 17. I’ve run mountain 100s, a double-digit number of them. 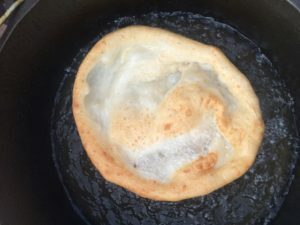 I thought this one should be a piece of cake, no, make that a piece of fry bread with honey, in comparison. I was wrong. 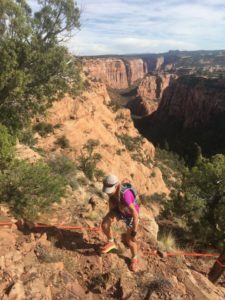 When registration for the Canyon de Chelly Ultra opened back in February, the race filled within minutes. On October 8th, those of us lucky enough to get in gather around the campfire at dawn, for a traditional blessing ceremony before the sunrise start. At the pre-race meeting, Shaun has told us how native runners greet the morning with shouts of joy. He know invites us to do the same: “Let it out! When you feel it, whenever you feel that connection, don’t hold it in!” Three, two, one, and we’re off, into the mouth of the canyon, under a sky filled with pink clouds, almost too perfect to be true. I feel like the luckiest woman ever born. The exuberant mood is contagious, and the rising sun smiles on the horizon. Even the skeptics among us seem to know all of a sudden what Shaun was talking about. We yell like maniacs until the deep sand takes our breath away. I zig-zag, trying to find firm footing, without luck. The first and last few miles of this race are a very long, very deep sandbox. Part of me wants to settle into a slow jog and just enjoy the day, but another part feels ambitious. Having checked out my competition on Ultrasignup the week before, I know I have a decent chance at placing in the top 10. Like two little gremlins sitting on my shoulders, these two parts of me start to argue. Complacency says, in a sooting, reasonable tone: “Oh come on, you’re 46 years old. You deserve to slow down a little, and to just enjoy the scenery.” The competitive instinct, a sly, wily creature, sounds belligerent: ”Hah! Who are you calling old? 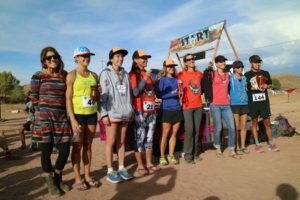 We can still beat a ton of these young whippersnappers out here!” And so forth, until the competitive instinct wins – this is a race, after all, and racing all out is part of the Navajo running tradition. I don’t want to disrespect our gracious hosts, so I resolve to enjoy every moment of the day while giving the course all I have in me. I try to find a pace that won’t wear me out before mile 5, without letting the lead women get too far ahead. The deep sand turns into a double track dirt road, meandering around cottonwoods whose leaves are turning golden. The morning air feels crisp. A couple of horses, one grey, one spotted, watch us from just a few feet away, mild curiosity in their eyes. I realize, with a burst of joy, that it’s possible to race hard and still feel the beauty all around me with every step. A familiar ponytail bounces ahead of me. My steps quicken. It’s my nuun teammate Laura Swenson, a very strong runner, struggling a bit today. I pass her, and begin to wonder how many more women are ahead. The trail narrows to singletrack. A gentle uphill soon becomes steeper. 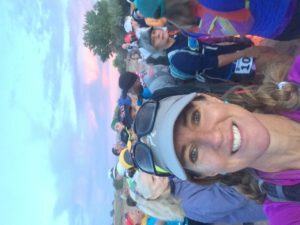 The first-place runner comes charging down like a fleet-footed apparition, waves at me and disappears around the pinon trees. A few more speed demons follow him closely, none of them female. 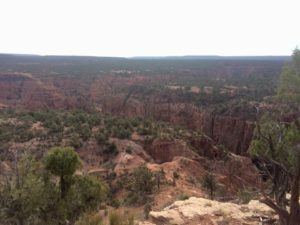 The gnarly climb to the turnaround on the canyon rim slows me down to a hike, up rocky inclines that are almost vertical. Finally, the aid station, manned by an energetic, enthusiastic group of teenage kids. The first place woman is only a few minutes ahead of me, with last year’s winner Christine Garves hot on her heels. I realize I am third, which gives me a jolt of extra energy. The overcast sky keeps temperatures manageable. Resisting the temptation to charge back down into the canyon right away is difficult, but I am smart for once. I sit down to empty about a pound of sand from each of my shoes. Prepared to chase down the ladies ahead of me, I soak up the views from the rim for a few more seconds, then scamper down the rocky trail as fast as I can while remaining upright. I pass Christine. Second place, with 17 miles to go, which is way better than I had hoped for. On the other hand, I now see more strong-looking women behind me climbing up, including Laura. They’re close, too close for comfort. I keep hearing that the lead woman is just a few minutes ahead, even catch a glimpse of her in the distance once or twice, but can’t catch her, though I’m running as hard as I can once I reach the canyon floor. Slower runners are making their way toward me, among them my husband David, struggling with cramps, as I learn later, on his way to a halfway point DNF. 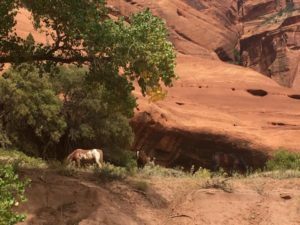 A quick hug, and onward, through the red rocks, the trees decked out in fall colors, past the horses dozing in their shade, past the jeeps carrying wide-eyed tourists and their guides. I suddenly realize I have run a marathon without taking in calories, so I pull a stinger waffle from my pack and nibble on it, trying to neither fall nor slow down. Six more miles, then five, then four. The packed dirt turns back into sand, which is now even deeper than it was this morning because of all the jeeps driving through it. My legs begin to protest against my brain, which tells them to keep moving, dammit. Like Scotty from Star Trek, they groan “I’m giving her all I’ve got!” in a gravelly voice. Two more miles. The sand swallows my feet past their ankles. Every step costs more effort than the last, but every step moves me closer to the finish line. I glance ahead. No trace of the first-place woman, who probably has finished by now. I glance behind me. No trace of Christine. Out of breath, out of steam, out of all energy, I slow down to a lumbering gait, like an aged camel on the last leg of a long trek across the Saharan desert. Moving along in this not very elegant fashion I savor the last mile. But once the finish line comes into view, not wanting to embarrass anyone who might know me there, I manage a sort of almost-sprint for the last 50 feet or so. The clock says 5:39, six minutes slower than two years ago. The sand was about six inches deeper, so maybe that’s why. Shaun Martin waits with a hug and hand-made necklace for every finisher. He seems to be everywhere at once today – at the turnaround, taking pictures on the course, at the aid stations, at the start, at the finish. Has he cloned himself? I ponder this question while I collapse on the sand, my legs sore but my heart filled with gratitude. 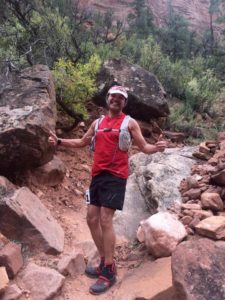 Shaun Martin is a man of many talents: runner, race director, finish line hugger, coach, motivational speaker, cultural ambassador, cheerleader, silversmith, and who knows what else. 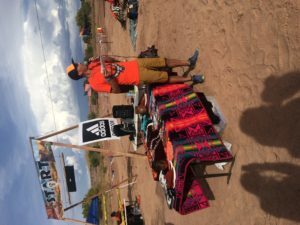 The Canyon de Chelly Ultra is not the only race that offers hand-made awards. Shaun is, however, the only race director I know who makes each of the beautiful finisher necklaces and age group award bracelets with his own hands and treats each of the 150 runners in his race like long-lost members of his extended family. The award ceremony at Canyon de Chelly is as unique and as authentically Navajo as the rest of the race: the aroma of mutton stew and fry bread fills the air, and hand-crafted awards – rugs, pottery, jewelry, each more beautiful than the next – are arranged on a table. The winner gets to choose first, then the second-place finisher, and so on, all the way to tenth male and female, respectively. I have my eye on a silver and turquoise concho belt, hoping that Ali, the women’s winner won’t feel the same. She doesn’t, and I get the belt. Christine, Laura, and the rest of the women’s field gathers for pictures, hugs, handshakes. 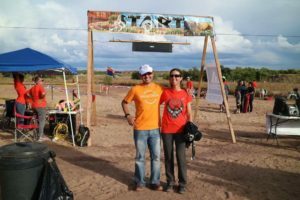 Shaun, his family, friends, and the Navajo Nation have made this race into something much more important than an enjoyable athletic event in beautiful surroundings. 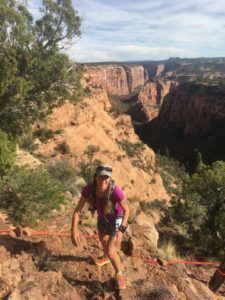 The Canyon de Chelly Ultra uses running as a bridge between cultures: something that unites us, something we can share and appreciate, in spite of our differences. 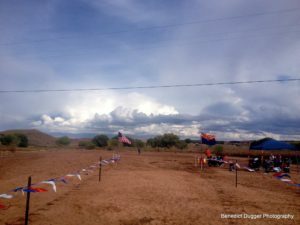 As we say hesitant good-byes to all our friends, my heart overflows with gratitude: for this beautiful day, for the hospitality we enjoyed, for sharing it with the amazing community of trail runners, for the opportunity to experience a small aspect of the Navajo way of life from the inside. When my more spiritually inclined friends tell me about their practices and beliefs, I try to keep an open mind, or at least to not roll my eyes. But since I started running ultras, my cynical outlook has softened. 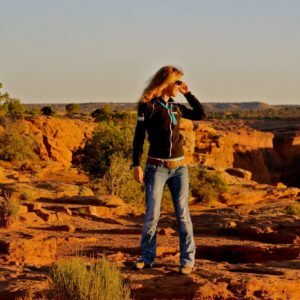 I still don’t believe in any supreme being, but I have experienced something my more enlightened friends would describe as spiritual: a sense of connection with the earth under my feet, the cottonwood trees lining the trail, the wild horses grazing in the canyon, the red cliffs towering on either side. I feel a kinship with the other runners who travel along the same path, sharing the same goal of reaching the finish line. I feel exuberantly happy, bursting with joy. I love life. I want to hug everyone I see – people, horses, even the cottonwood trees. Running has made me physically fitter. Running has made me emotionally happier. Now, is seems, running has made me less of a skeptic. And running the Canyon de Chelly is as close as going to church as I get. This entry was posted in Uncategorized on November 1, 2016 by silvakat. Very awesome read! I can sense everything in your race report!.. Thank you, April! This race is the best. Nice post. Good on you that you are still growing. Mary Ann, I’m not sure if I’m growing or regressing, but thanks! I know exactly what you mean about running having had a softening affect. For me I used to be so rule bound, but even running the roads did not help. It was all about set distance, and pace each day. It was not until I committed to hitting the trails that everything changed. Throwing out time, or distance as measures for goals on a run was a very humbling experience, along with realizing how awesome nature is, and what I had been missing. Thank you for sharing your experience of the race, and congratulations on getting second place! Thank you for your thoughtful words, Adam. I’ve been on a similar journey. Now I finally can feel meditative and relaxed on the road, too, when I can’t get on a trail.